Read the Lab Math blog for the latest tips, techniques and refreshers from Dany Adams. 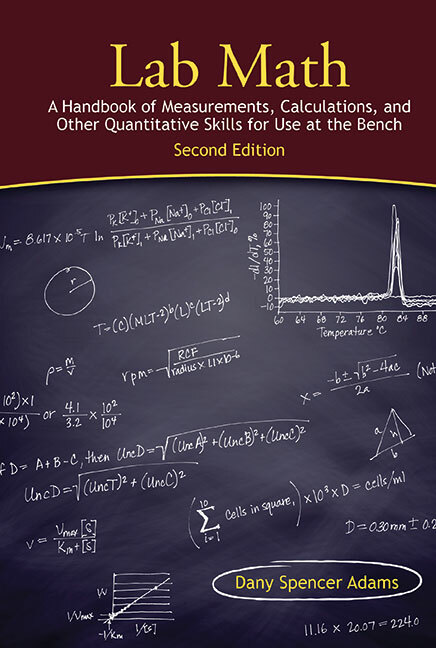 Lab Math: A Handbook of Measurements, Calculations, and Other Quantitative Skills for Use at the Bench, 2nd edition, collects in one place the numbers and equations you rely on for your experiments and use to report your datawhat they mean and how to use themas well as easy-to-follow shortcuts for making the math easier. Written in an accessible and informal style, Lab Math describes basic mathematical principles and various tasks involving numbers, including how to calibrate lab equipment, how to make solutions, and the numbers involved in various methods for quantifying DNA, RNA, and proteins, and an all-new section on quantitative polymerase chain reaction. Basic statistical ideas and methods and the proper reporting of uncertainty are described in simple-to-understand language. Also included are reference tables, charts and plug-and-chug equation blanks for specific experimental procedures. Since the publication of the first edition in 2003, Lab Math has become an essential math reference and teaching resource for both on-the-spot practical information and background for understanding numerical tasks. Important additions in this second edition make Lab Math an even more useful tool for every laboratory.